Go to the Overview/Current Conditions page of any water resource on the Water Atlas and you will find a new feature below the map viewer. The Data Summary component lists all water quality and hydrology monitoring stations for the water resource by name and station ID. Clicking on a station datasource brings up a window that gives the data transfer schedule for that station, the date and time when data were most recently received, the "period of record" for the station (the beginning and ending dates for which data exist) and a link to the metadata for the station. Beneath the station list, the Data Summary component has links that allow you to quickly download data from some or all of the stations listed, shortcutting around the filter selections you usually have to make when using the Data Download tool and taking you directly to Step 4 in that process. 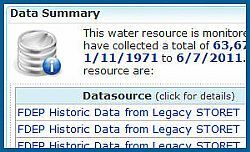 Just choose the station(s) of interest and download or graph your water quality or hydrology data. Simple! Try out the new Data Summary tool and let us know what you think!